Discussion in 'Weapons, Technology & Equipment' started by von Poop, Jun 1, 2007. Got a couple in recent magazine articles but they're modern restorations or swimming so the scheme isn't clear, those ones appear to be carrying swirls of grey/green/brown. whos got a new model then? I couldnt find one. I end up doing mine in a Britsh'esc sorta green. Found I've got a colour profile of an Iwo Jima DUKW but it's a rather dull 2 shades of sand over OD, still looking for a more interesting pattern on an LVT. An interesting one around the time of Iwo Jima was a camoflauge of dark blue similar to navy non-specular blue or ocean blue that was carried by a few of the LVT(g) types. What I'd really like to know though... Is what colour they painted 'em, any ideas? I thought possibly the same brownish tone as their Centaurs?? Nothing about colours, though, sorry. (That Fletcher man again) Royal Marine Armoured support group (DDay Centaurs), reconstituted as 29th Infantry Battalion RM, then used to form the 34th Amphibian support Regiment RM in '45. Four batteries, two using the 75mm LVT(A)4, the other two being flame and rocket respectively. The 'specials' were mounted on standard LVT's rather than the turreted (A)4. Flame equipment was a pair of 'Wasp' projectors on shielded stands (designated 'sea serpent'), trials showed if it got too choppy they just went out. The rocket battery was a dozen of 'em with trays of Hedgehog launchers, 72 shots possible in 3 minutes (ideally that's 864 rockets delivered from the sea, quite a hefty barrage during a beach assault, inaccurate or not!). I've got 'em returning to Britain in '46 but still many of the same blokes performing demonstrations for the next two years. But what colour were they?! Quite tempted to find out more about the Rocket launchers, fancy a bit of scratch-building... even though I'm terrible at it. The colour pics I have of them in the Pacific are mid grey, I don't know whether this is what you have in mind. 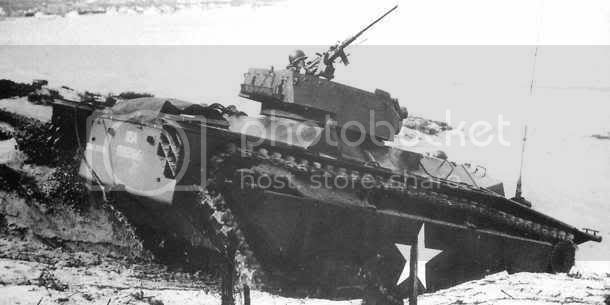 I never think of LVT-4 being able to carry that much weight, in water or on land. How much does the Daimler weigh, 5-6 tons (US) or more? I guess I could look it up, but some of you braniacs probably know it off the top of your heads. I couldn't believe the size of the LVT itself mate, I'd thought of 'em as small things for years until seeing pictures of all sorts of gear being unloaded. The series was featured in "Classic Military Vehicle" quite recently (May 2007 onwards) is this the 'recent magazine articles' you mentioned? The one I have found shows US Marine corps LVT's in 'Ocean grey' a dark blue/grey. Nothing very fancy. I guess 5-6 US tons would be a bit long, that's10-12K pounds. Still 2 1/2 tons is a lot of weight for a tracked vehicle to waller around in the water with. they were what (somewhat serendipitously) largely answered the first question just after I asked it, Don't remember an RM colour scheme though. I'll double check 'em. my grandad was a bofors gunner during the rhine crossing.he said those buffalos were bloody huge things full of infantry.yours,4th wilts. Another episode in the Tank Chats Funnies Specials, with David Fletcher looking at the weird and wonderful vehicles of 79th Armoured Division led by Major General Percy Hobart, known as 'Hobart's Funnies'. The Buffalo, or Landing Vehicle Tracked IV (LVT), is a lightly armoured tracked amphibious carrier. British ‘Buffaloes’ were used in Northern Italy during WW2 and were issued to the 79th Armoured Division in Northwest Europe where they played an important role in the crossing of the Rhine, in 1945. This particular Weasel is amphibious and was used in muddy and wet conditions, rather than directly in water. Aixman and CL1 like this.